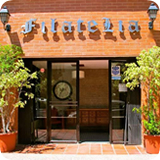 Hotel Filatelia is located at the Mariscal district, sharing the block with the Hilton Hotel & the famous El Ejido park, Only 1 km from Quito’s historic centre and financial zone, Apartamentos Filatelia offers rooms and apartments with free WiFi and continental breakfast. The property is 500 m from Casa de la Cultura Ecuatoriana Benjamín Carrión and 1 km from the Pontifical Catholic University of Ecuador, and located near public transport services and many gastronomic options. A 24-hour front-desk is available to provide tour information to guests wishing to explore the area. Free parking is provided, and airport shuttles and car rentals can be arranged for an extra fee. Apartamentos Filatelia is 35 km from Mariscal Sucre International Airport.